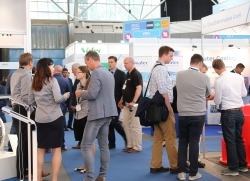 Over 4,000 attendees descended on Electric & Hybrid Marine World Expo in Amsterdam this June (6-8 June 2017), with over 130 exhibits to see and some 60 conference papers to learn from. It was a year that welcomed more attendees, delegates and exhibits than ever before, but the show was also significant for the sheer number of new technologies that were launched. 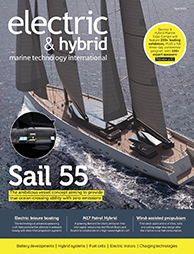 Established as the world’s largest dedicated marine propulsion exhibition and conference, the success of Electric & Hybrid Marine World Expo 2017 was a clear signal that more electric assistance is now essential in the maritime industry. Take, for example, Renk, which showcased its new MARHY (marine hybrid) concept that enables two-stroke engine users to harness electrical energy for either propulsion or power generation. The MARHY system features a tunnel gearbox and propeller shaft clutch enabling the two-stroke engine to be connected to an electrical motor. The electrical package includes an asynchronous motor, active front-end frequency converters and couplings. MARHY can be used with fixed pitch and controllable pitch propellers and can also be used by ship owners to reduce the number of gensets deployed on a vessel, either by generating electricity for storage in a battery or through enabling the main engine to be used as a generator. Meanwhile, MAN Rollo revealed that it has supplied two MAN D2676LE424 engines, each generating 382kW at 1,800rpm, for the RPA8, a hybrid patrol boat, commissioned by the Port of Rotterdam Authority at Kooiman Shipyard. When putting out a tender for the patrol boat, the Port of Rotterdam Authority specified that the vessel be equipped with a hybrid propulsion system combining diesel-electric and diesel-direct power; diesel-electric fed to one of the engines up to a speed of 25km/h and diesel-direct for both main engines at speeds between 25km/h and 35km/h. Elsewhere on the show floor, The Switch revealed that it has delivered its first DC-Hub to Wightlink in the UK for installation into the ferry operator’s flagship new-build diesel-electric ferry. The current delivery will be installed by Wärtsilä on the 90m new-build vessel at the Cemre shipyard in Yalova, Turkey. The craft boasts capacity for 178 cars and more than 1,200 passengers. It is part of Wightlink’s US$58m Investing for the Future programme, which is scheduled to begin operation in the Solent strait in the summer of 2018. The Switch also has two new DC-Hub deliveries in the pipeline and will be taking on five new people over the next month to prepare for increased market demand.